Minecraft’s Update Aquatic is focused on life under the sea. The update adds tons of new blocks and items to the game. One notable addition is the new weapon, the Trident, which is every bit as mighty as it sounds. The Trident is currently the only weapon in the game that can be used as a melee weapon or thrown at enemies. If a Trident is thrown, it must be collected from where it lands, unless it has been enchanted with Loyalty, in which case it will return to the player. Tridents deal 9 damage (4.5 hearts) when used as a melee weapon (fully-charged), or 8 damage (4 hearts) when thrown. 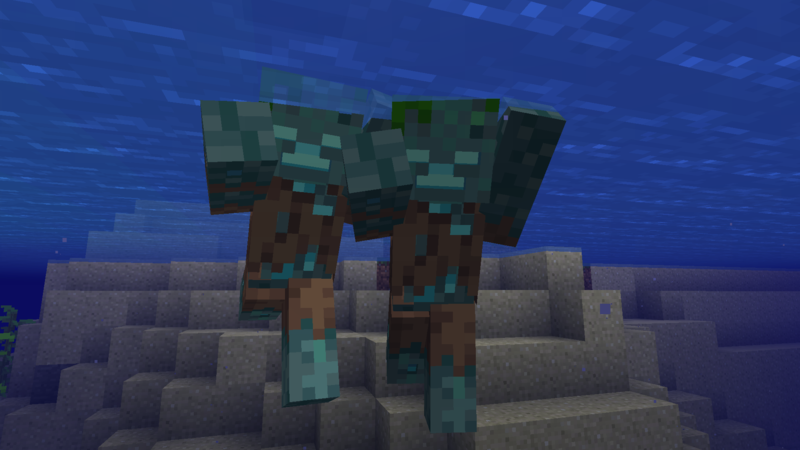 Tridents cannot be crafted and are only obtainable as a drop from drowned, a newly added underwater zombie mob for the update. In Java Edition, Drowned that are not wielding Tridents cannot drop them. In Java Edition, only a drowned that is actually wielding a Trident has a chance (8.5%, increased by the Looting enchant) to drop one. In Bedrock Edition, there is also a chance for a Trident to drop from drowned which are not wielding Tridents, but at a significantly lower rate. Unfortunately, you cannot pick up a Trident that has been thrown at you by a drowned, only those dropped as loot. It’s also worth noting that only naturally-spawned drowned can drop Tridents, so they will not drop from zombies which have converted into drowned (by, you know, drowning). A looted Trident will have random durability, and can be repaired by combining two Tridents at an anvil. Remember to use an anvil instead of a crafting table, or you’ll lose your Trident’s enchantment. A Trident can also be repaired if enchanted with Mending, which adds points to the weapon’s durability when XP orbs are collected, at a rate of two durability per XP. Due to the fact that Tridents must be looted and will typically have low durability upon obtaining, the Mending and Unbreaking enchants are desirable options if you don’t want to have to consistently farm for replacements. Curse of Vanishing makes an item disappear on death, which isn’t all that helpful. There are also four new, trident-specific enchants: Riptide, Channeling, Impaling and Loyalty. The Riptide enchantment is new in Update Aquatic, and allows you to use your trident to launch yourself forward by throwing the enchanted trident while underwater or while it is raining. Doing so won’t cause you to throw your trident, so you don’t have to worry about finding it again after you land. You can combo a Riptide Trident with an Elytra to get set some serious height and then glide to safety. Whee! Channeling is another water-affected enchantment added with the update. This enchantment summons an incredibly powerful lightning bolt at your target when the trident is thrown in the rain. The lightning bolt will only strike if you successfully hit the mob, so may your aim be true. The Channeling enchantment is mutually exclusive with Riptide, so be sure to keep that in mind when enchanting. You wouldn’t want to launch yourself into a lightning bolt, right? The Impaling enchantment increases your attack damage against aquatic mobs, such as guardians, turtles, and dolphins. This is an okay general purpose enchant to have for farming these mobs for desirable items, including prismarine shards and crystals. Unfortunately, it doesn’t affect your damage to drowned, as they’re classified as undead mobs, so don’t get your hopes up for creating a Trident-farming Trident. Loyalty is another new enchant for the trident that causes it to return to you automatically when thrown. It adds a visual chain to the end of your trident and is increasingly handy if you don’t want to keep chasing after it. Your trident will return faster at higher enchantment levels.